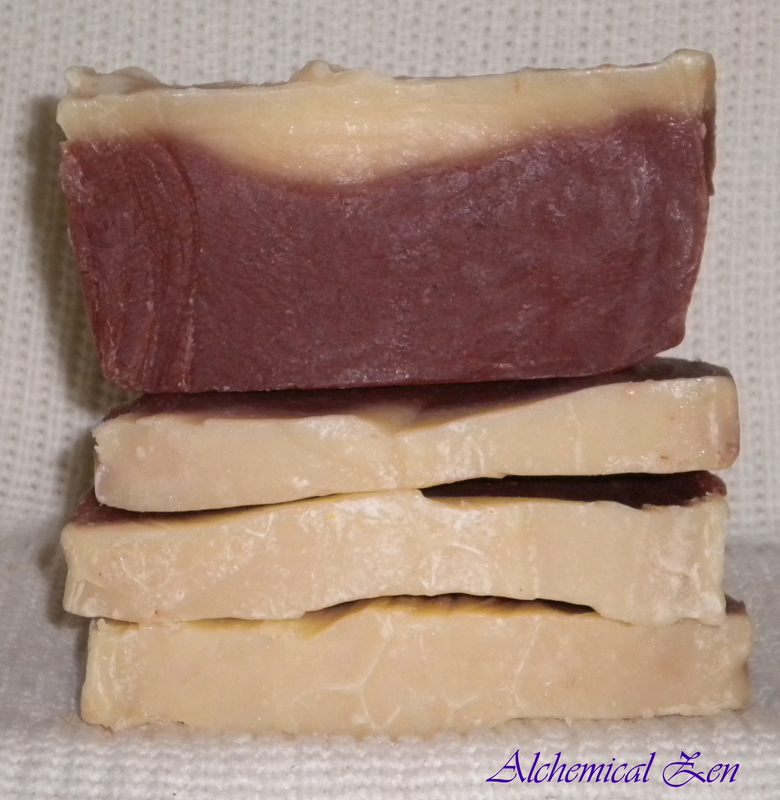 I made my very first batch of soap a year ago on April 28th. 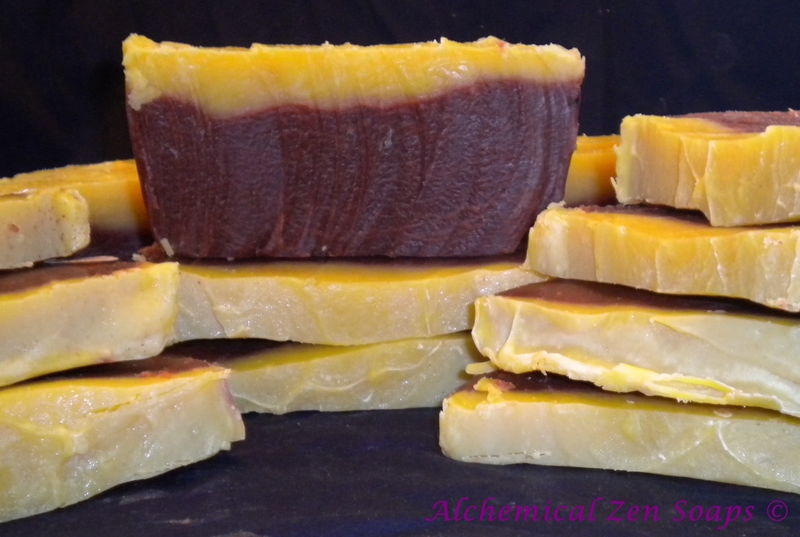 It’s a citrus blend that I copied from a Soap Making Resource recipe, nearly ingredient for ingredient, with a couple additions which you can read all about here. 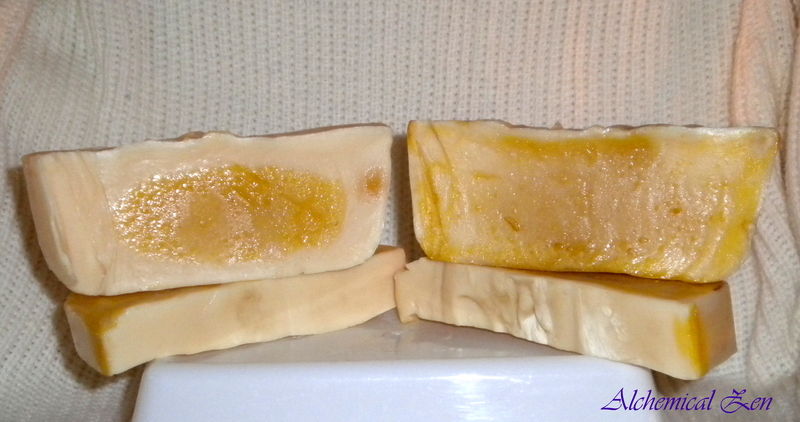 This soap was cut with a guitar string, which is why its ragged and uneven. The above picture was taken a year ago right after it was cut – the day after it was poured. The following picture was taken a couple days ago. Not much of a difference, right? I’m pretty pleased that the color and scent has stuck around so long. A year later and no DOS (dreaded orange spots). My Summer Solstice is based loosely on this recipe, with a few changes to make it my own. 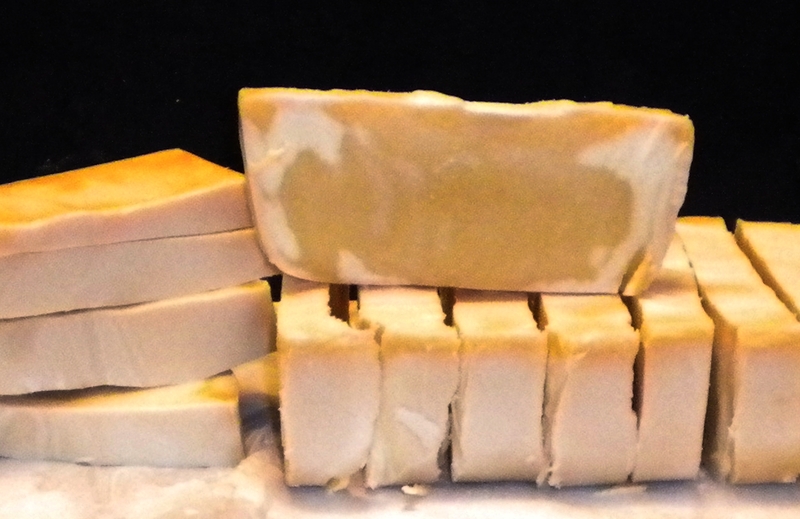 So, I decided to check out how my laundry soap did (which I blogged about here and here when I was still talking about my soaping hobby on my personal blog). I used all vegetable shortening. Please keep that in mind when viewing the next couple photos. I’ve only done one load of laundry with this soap, but I didn’t like how it smelled, since it didn’t have any scent. I like my laundry to smell yummy. I haven’t touched or looked at this batch in months. This batch is also over a year old, poured on May 3rd. It was partially gelled, which I didn’t know what that was at the time. I thought it was odd, but was more concerned with the soap ash on top. It also was cut and photographed the day after it was poured. What in the…?! Yuck! I have it stored in a drawer on freezer paper. I stuck my hand down to grab these four to bring them out and immediately dropped them back into the drawer when I felt how slimy it was. It smells. I can’t place the smell, but smells like its rotting. So, I went and got a paper towel and a plastic bowl and set them up for their photo shoot. I’m actually embarrassed to be presenting these, but its a learned lesson. Don’t use cheap oils. This seems like DOS to the extreme. Do any of my soaping followers know? This entry was posted in Cold Process Soap and tagged year later. Bookmark the permalink. Vegetable shortening will go rancid.